The big news lately, is that Rene has been busy making lots of fun new hand stamped metal jewelry perfect for tripawd moms. 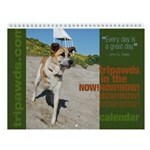 But we wanted to share the news of the Cafe Press sale going on right now in the Tripawds Gift Shop too! Cafe Press Coupon Code SHOPTA2. 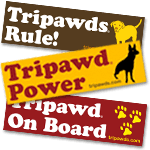 There are plenty of ways to help keep the Tripawds community online, but why not show your love for your three legged dog at the same time? 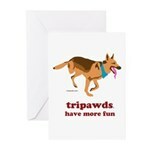 Together we can help prove to the world that Tripawds Rock, Tripawds Rule, and Tripawds Have More Fun! *Save 10% off CafePress shop orders of $40 USD or more, excluding shipping charges, gift wrap charges, applicable sales tax and custom duties. All orders must be added to cart from CafePress shops only. Excludes CafePress marketplace purchases (e.g. all products added to cart from URLs beginning with the following (i) shop.cafepress.com, (ii) t-shirts.cafepress.com and/or (iii) www.cafepress.com/sk/), Gift Certificates, Flip products, SIGG bottles, Thermos products, yoga mats, Dreams products, Fathead products, and CafePress Make and bulk orders. Coupon code SHOPTA2 must be entered at check out. Promotion starts on April 30, 2012 at 12:00 a.m. (PST) and ends on May 5, 2012 at 11:59 p.m. (PST). Offer valid online at CafePress only, cannot be combined with any other coupons or promotions and may change, be modified or cancelled at any time without notice. This promotion cannot be applied to past orders. Check the Current Promotions widget at right for any currently available cafe Press coupon codes to save on your favorite three legged dog t-shirts and gifts!